With more than half of all first marriages ending in divorce, it's time to re-think the notion that "divorce" means "failure." Therapy with Single Parents focuses on the strengths of the single-parent family rather than its weaknesses, stressing the need to look at the socially constructed norms, values, and definitions associated with marriage and family in order to provide effective counseling. This unique book examines experiences that are common to single parents and presents interventive strategies for treating single-parent family issues, drawing on clinical case studies to provide technical knowledge in everyday language. Current research shows that single parents account for 27 percent of family households that include children under 18 and that the number of single mothers in the United States more than tripled between 1970 and 2000. Therapy with Single Parents challenges outdated notions that the single-parent family is somehow deficient and associated with adjustment problems in children. It doesn't ignore the anger, pain, sadness, and guilt experienced by many members of single parent families but offers therapeutic considerations from a more balanced approach. The book examines the social, psychological, and sexual experiences of newly single parents and addresses the ups and downs they'll face in dealing with schools, the workplace, and social services. the therapeutic value of social networksTherapy with Single Parents is an invaluable resource for psychologists, professional counselors, social workers, and marriage and family therapists. The book presents a thorough, in-depth examination of the single-parent family system as a viable, healthy family form. 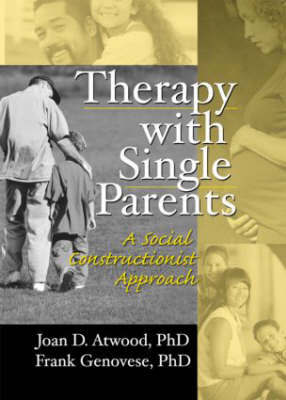 "Therapy with Single Parents: A Social Constructionist Approach is an indispensable resource for professional counselors working with single-parent families, school guidance counselors, and educators who teach in the areas of Social Studies, Sociology, Psychology, Gender Studies, Cultural Studies, and Education. Authored by professionals with backgrounds in practice and teaching, this book will have wide appeal. While the authors by no means ignore the emotional and financial problems often experienced by members of single-parent families, they present a more balanced view - based on recent, sound methodological research - of the single-parent family as "a viable, healthy family form." This is a welcome and revolutionary claim that challenges entrenched social stereotypes." "This book provides practical information, using common language for clinicians and others who work with single parents/systems...This book strives to depict single parenthood as a viable family structure instead of a deficit position...I would recommend this book to therapists working with single parents...one of the first of its kind to address the unique experiences of single parents and should be applauded."